All blessings are connected to God. ALL BLESSINGS! And sometimes when I listen to people they try and take credit for it. They try to bring the attention to what they did. Look I don’t dispute what ability, one may, or may not have. And I just think, we need to be mindful, that all good things come from God, in one form or another. Its enough, to realize, how important it is to give God glory. Its so important to acknowledge His great accomplishments, and love, that just may trickle down to you. Do you have food, do you have a roof over your head, do you have family? More then anything, do you have your salvation? God made that way through Christ. And if you have not ensured your salvation, make the choice even here to do that. God is using me to remind you, your eternal salvation is at stake. Love Him, repent, and live for Christ. Get a good King James Bible, and let God speak to you every day of your life. Never be ashamed. Never…..
Give God glory friends, it is the right thing to do. I Love you in Christ, and more then anything Christ loves you. Look at this scripture slowly, eat it, and be nourished, with wisdom. More then anything Father, I love you, I thank you for prayers answered, and not answered. I am just grateful, and I thank you publicly, and give you glory, honor and praise. You are the root of all my blessings, and all good things come from you. In Jesus name, Amen. 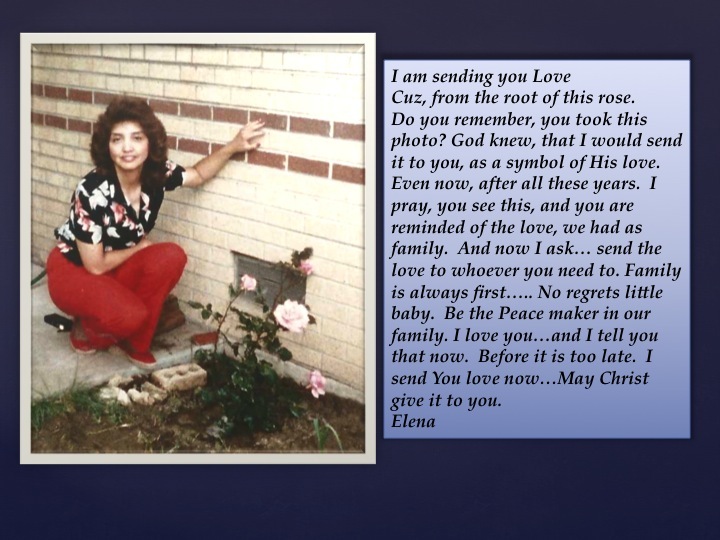 ANNOUNCEMENT OF NEW BLOG ~ “DEAR ELENA” SCRIPTURAL ADVICE. Announcing my new blog. 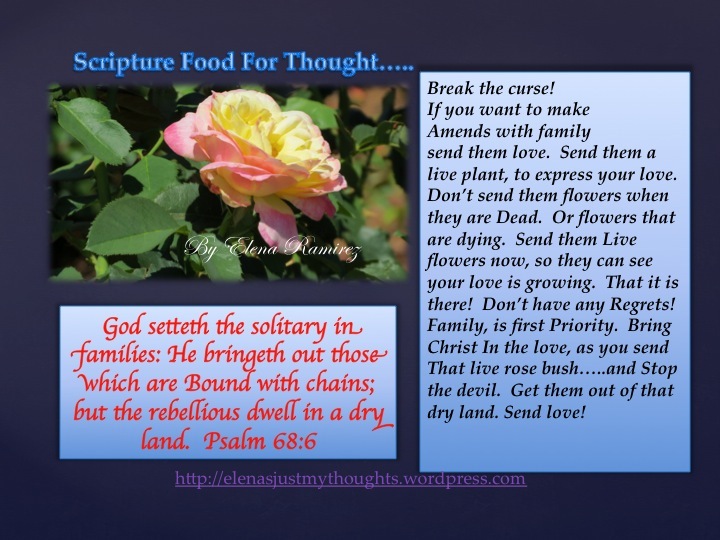 “Dear Elena ~ Scriptural Advice. Here you can ask questions, and I will answer them if I can, from a King James perspective. All questions are confidential, and you can also remain anonymous, to respect your privacy. At the top of the blog, is a page, that gives more information, as to the blog, and requirements etc. “Dear Elena’s help by God”, but I changed the title. As I write this, I pray, with all the love I can muster up, in who I am in Christ, I can express this. To bring grace and truth. John did see this, and he understood, who Christ was. For Yes….IN THE BEGINNING WAS THE WORD, AND THE WORD WAS WITH GOD, AND THE WORD WAS GOD. THE SAME WAS IN THE BEGINNING WITH GOD. ALL THINGS WERE MADE BY HIM; AND WITHOUT HIM WAS NOT ANYTHING MADE THAT WAS MADE. IN HIM WAS LIFE, AND THE LIFE WAS THE LIGHT OF MEN. AND THE LIGHT SHINETH IN DARKNESS AND THE DARKNESS COMPREHENDED IT NOT. John 1:1-5. Do you comprehend, and understand that Christ is the Word, of God? Do you comprehend, that Christ came in the flesh, and dwelt among us? Do you comprehend and see in the darkness? Who Christ is, He is the light of the world. The light has shined, but those in darkness do not comprehend it. I was in darkness, and I admit, I did not understand. And I was a Christian….groping, blindly. The enemy had blinded me. Even as a Christian. He deceives. Thats his job. But God in His mercy, searched for me, found me, and took me out of the darkness. But, I had my part, and I still have my part. As long is breath is in me, by the power of God, by His ordaining it. He teaches us, He is teaching me…..and I am committed to be obedient to Him. For lately, I admit, I am seeing more, and more, in His word, that He just brings to me, daily, as I open my Bible, He directs my eyes to see His truth. The fear of Him…. Dear ones, I have to be blunt. The body of Christ is missing it. They are not seeing the truth. One reason, is they have disregarded, the Word. The true word. Christ is that word. But the word they are reading is not truth. It is compromised, it is distorted, and there is no power in it. It is picked and chosen, for what people want, and it is watered down. It is not anointed. All of these Bible versions, have distorted the truth. God has been showing me, that the body of Christ, does not have the fear of Him. They are choosing their own ways, love is not being taught. Our world, our country, is under a curse, with abortion, and every other filthy choices that are being made, and we have to get back to Gods truth, thats the only way, we can have a chance. God is angry. I sense it. And I am afraid, of that anger for our world, for our nation. For me, for my own life. For my soul. For He has power to say either heaven or hell. Yes….I fear God. I have written about this before, do a word search on the fear of God, in my posts…. But I say this now with full force! God is angry. Yes, Christ came in love, and peace. But He came to fulfill the law, not to abolish it. THINK NOT THAT I AM COME TO DESTROY THE LAW, OR THE PROPHETS, I AM NOT COME TO DESTROY, BUT TO FULFILL. Matthew 5:13. Christ told us we did make errors, not knowing His word, and may I add, not knowing His true word. YE DO ERR, NOT KNOWING THE SCRIPTURES, NOR THE POWER OF GOD. Matthew 22:29. Dear Friends, what I share with you, I share with you in love, and I plead with you. Our society, and even we as Christians get so offended, if we share truth, or if we even speak Gods word, it convicts us. And to those, who have been used by the enemy, it offends. If His love is in us, we are not to get offended with one another. We wonder why as Christians, we are not in agreement? One reason again, is the word, and the spirit attached to it. One is truth the KJV, and the other are counterfeits. There is no way agreement, can be reached with the different spirits, that are not truly Christ, dwelling in us. And our society, has let even just a few dictate, because they did not believe. I read just the other day, one person, only one person, had the objective, to stop a city, from sharing a nativity scene, and they stopped it. Look what we could do, if we were truly united in Gods TRUE word? If we could be bolder for our nation, and yes, demand our rights as Americans, but not only Americans but humans. Seeking God, is our human right. We are created in His image. Christ will return, and many will say, Lord, Lord, and He will say I knew you not. And do you know why He is going to say that, because you really did not know Him. Matthew 7:21. NOT EVERY ONE THAT SAITH UNTO ME, LORD, LORD, SHALL ENTER INTO THE KINGDOM OF HEAVEN BUT HE THAT DOETH THE WILL OF MY FATHER WHICH IS IN HEAVEN. How can any of us be assured? If we choose rightly. But if you do not, it is because the fear of God was not in you. And……You chose a Bible, that was not His true voice. I implore you, Christmas is coming. We need God more then ever, but if you are reading a watered down version, that is not the King James Bible, for your own Christmas gift, put it away. Put it aside, let the Word, that came to dwell among us, Christ, be that gift, that shines in you. Do it in fear of God! You have part of it, but you need the full dose, the full measure, of who Christ is, so you can know who you are. You will see the difference. Spiritual confusion will leave you. I know when I quit reading the other versions, I felt my thoughts change. My faith grew. My trust in God, did not feel distorted. In fear of God, do this. I do implore you. I am worried, for the body of Christ. I do not see pastors, teaching the fear of God. I do not see them, teaching love. Its been the prosperity message, in full force. We have to stop, and see this, in fear of God. I am a crier, in the town square, and many are listening, but many are disregarding this, and just walking on. Doing their thing. And some in the name of the Lord, thinking they are right. But they are not. Offended, angry, they feel this is something that is personal. And its not. Not if we are walking with Christ, the way we should be. For He is the way, the truth, and life. John 14:6. I know I am right in this, truth. AND BECAUSE I TELL YOU THE TRUTH, YE BELIEVE ME NOT. JOHN 8:45. God has been bringing it more, and more to me. I have such a very, very strong sense of this. God is angry! He is angry folks. With all the evil. He is angry with us, because we are not seeing it. He is angry, with those who mock Him. He is angry, with agendas, that do not include Him. He is angry, with the devil. He can destroy, remember past accounts from His word. God has power, but we have disregarded it. We have let people stop our walks, our faith with Christ. We have become ashamed, of who we are in Christ. We are the greatest Christian nation, in the world, but we are ashamed to say Merry Christmas. Well I say happy John 3;16. Wake up! What has happened to us? As a nation. As for me I can only speak now for myself, but I pray, that is not seen in me, but we as the body of Christ, are useless right now. We need to discipline ourselves in Christ. Stop and pray! We are in end times. I am not sure when, because no one knows that according to Gods word. Read Matthew 24;36. But even in fear of God, knowing our lives are in His hands, makes me realize. How holy, and good God is. How powerful, how mighty, and splendid, is His truth, and ways. We need to change. We need God. Our society needs Him. You could make such a difference. For the body of Christ, if you would just do this. God could then use you mightily. I know a few people, who have such an anointing, a gifting, but they do not heed this truth. If you would change your Bibles. To the King James Bible, it has been preserved for over 400 years. He did that, for a reason. His sheep know His true voice….and they follow Him. He layed down His life for us, how can we not see this? John 10. If you let the word of God dwell among you, and in you……Read Jeremiah 6. KJV. Jeremiah 6:10, and verse 16. This is for someone who understands who hears and sees. And Read John. KJV. AND AS A SPECIFIC REFERENCE, IF YOU READ ANY SCRIPTURES, I RECOMMEND, TAKE TO HEART ALL OF PSALMS 119. IT RELATES COMPLETELY TO GODS WORD. Do it this Christmas, for you to have His presence, not just presents. And to any person, who reads this, I implore you as well, go to Christ, repent, and believe. Go buy a King James Bible. Your eternal soul, is at stake. I tell you this in fear of God. Just my thoughts, with Love, and yes again, I say it with love, in fear of God. I remember, when I was going through a lot of changes, and nothing would turn out right. And I had a sense, that God was saying, give me your all. And I looked at myself, and I knew He was right. I was walking the fence line. I was living, with half of me saying, I believe in God. But I was not completely obedient, or committed. The other half of me was living, in the ways of the world, and partying, being careless, with life. I won’t say what God did, to make me finally live for Him, and only Him, but lets just put it this way….GOD PUT THE FEAR OF GOD IN ME! And, maybe thats why I am so understanding, how important the fear of God is, as I write, and try to explain, knowing Gods truth, even here, and I try to tell you all, about what I have learned, and to desire Gods pure word, I don’t impose myself, for God is a gentleman too, but I pray, the body of Christ wakes up…..We are not going in the right direction. Life can be short, or it can be long….God has our lives in His hands. What are we going to do with it? Some day the Book of life, will be opened, and will we find our names in the Lambs Book of life? We never know when life will end. So we have to try do things right in this time, we are given…..To get right with God in our salvation. And to get right with people. For, one never knows. I am an adult woman, I have been around the block a few times. But I cherish, the life, God has given me. I cherish my family. I cherish my friends. I cherish, the gifts God has given me. I have been reflecting even now, how grateful to God I am. I am thankful, for all my blessings, and right now I just want to get close to God. I want to praise and worship him, in spirit, and truth. But one cannot do that, if they are mad at someone or unforgiving. You can’t it blocks, the love. And God is love, so we have to do what we have to do, according to His word, to unblock that love. If something is hindering it. I have learned a lot, and pray to keep learning. Maybe that’s why I write. To sort out my feelings, to bring some perspective, to things, I go through, that I have learned in life. I am blessed to have my immediate family. But, I did not always have a sense of family. I was raised, by my mother. And I want to say here, before I go any further. I loved my mother. I honor her, more then ever. As being a source of life, God used to bring me in this world. But….we did not always get along. I was day, she was night. Her and my father, were divorced, when I was just a baby. So, I did not grow up with the unity, of a father and a mother. Though, my father, was in my life, here and there. But, I always longed for a family. And that was not fulfilled, till I was older. I have a few family relations, not much. From my father, and my mothers side. But to be honest, the relationship with them is practically dissolved. I never got very close to those on my fathers side. But, on my mothers side, I have tried to keep communication open, with my mothers brothers children. My cousins. They have tried to. I love them. Recently, I had a bit of a tiff, with one of my cousins. It was so trivial. And in many ways, it was not even a tiff. It was basically a misunderstanding. No mean words were said. I believe she forgave me as I forgave her. But there still was that sense, of a loss of communication. Yet, things spilled over, that probably should not have. And I take responsibility for my part. But people also have to be accountable as well. In grace, we extend love, and love covers a multitude of sins. If they cannot be accountable. Because family, is family. We only get one blood family. And that through Christ. But it reminded me, of my past. It reminded me of my mother, it reminded me, that the devil, wants to destroy families. He wants to break up the love, and the unity in families. He comes to kill, steal and destroy. Thats his job, so we have to be on guard. We have to be aware of his devices, and unforgiving, is something he uses over, any of us who are not aware. He wants to divide family members. Ahhh, but the good news is Christ came to give life, and more abundantly. So we have a weapon against the enemy. I never want to see division like that in my family ever again. By the blood of Jesus. I thank God my immediate family, is built on the foundation, of Gods love. He is first as our foundation. His word, His truth, (KJV) His commandments, His love, etc. That is what brings our unity. For the Ramirez family is in unity. We respect each other. We honor each other. I honor my husband as the head of our household. He honors me as his wife. We taught this to our son as well. That family honors one another. You can have friends, but family is first. We do not let arguments, or disagreements, get in the way, of the flow of our family. We forgive. If we have a disagreement, and we do, sometimes, but we do not let it turn into any kind of resentment. We do not go away from each other, angry. And I pray, by the blood of Jesus, we never do. But we have to be on guard, to situations, like this, where the enemy, wants to dominate. We have to be on guard, to the deceptiveness of a situation. But, when I detected this little misunderstanding, with my cousin, which I will not get into all the details… I sensed, how the enemy, divides. I love my little cousin. I know she probably loves me too. But I had to try and share with her…. But, it just reminded me, that life is not promised to anyone. And when family, has misunderstandings, and arguments, and they walk away from one another. Did you know, we are giving place to the devil in that? We are to submit to God, resist, the devil, and he will flee. We are to be love, for God is love. I have heard many stories, being in ministry, about people who have loved each other, and some argument, or whatever happened, and people pass away, but there were regrets. An argument, something so petty, divided them, from their family members. I can relate to this. For I myself, have had regrets in love. With my mother. I just wish, I could have given her flowers, while she was alive. Not when she is dead. Not with regrets. And there were plenty believe me. We never got over that hump. There was resentment. But I loved her. But she is dead and gone…And I wonder if she knew I loved her. Not knowing, if she ever knew, how much I loved her. It, hurts me even now. As I think about it. But there was always this sense of a wall. And I could never reach her. You know, people have their personalities. Some are stubborn, some express things differently, but we are to respect one another, and love one another. I felt sad, after I had this little tiff, with my cousin. And I said somethings to her, not that I regret. But that had to be said. Maybe even because I am older, then her, by many years. I may have done it, out of my own pain. But I did it because enough of the devil breaking up our family. I told her things…Because I love her, and I see how the enemy divides. I see how he wants to break up families. I wanted to warn her in love, for us not to get touchy with one another. But it did not come out well. I even said some things, that had a deeper sense of my own loss. My own feelings. But, the timing…..I believe it was for a reason….Gods reasons. Have you ever thought, or seen the vision, of your Loved ones all being saved. Through Jesus Christ? I do, even as I write this. I want all of my family, to be in heaven, united, when we meet. Again…..The devil wants to stop that. He does not want that! But if you are saved, you can save another family member. You can stop the devil. You just have to believe, in Love. You just have to believe, that your effort, that your gift of love, will have a domino affect, and save, one family member, and then another. Your family, can be restored, and thats what I pray for my own family….. I just pray, we can get back on track and communicate in love, again. But it will take both of us to work at it. But it just reminded me. Of how short life is. You know flowers are beautiful. But, if your gonna send me flowers, don’t send them when I am dead. Send them when I am alive. And send me a rose bush. One that is alive, so I can see the love growing. We have to see that in each other. And for the record, right now, I am not asking for anybody to send me flowers. Even from my sweet little cousin. But do you know what I mean? Send love, while the time is available to love. Send someone flowers, to be an expression of love. Send a live plant, in the symbolism, that your love is alive. Make up with people. Forgive. Stop the plan of the devil. Try, don’t give up on love! We cannot have regrets. If we try to resolve situations. If we give no place to the enemy. Then we are doing our part, we are being obedient to God. We have to see the love in each other. We have to all keep growing with Christ. On that vine, that he has called us to be on. Family is first. Loyalty to family, should always be a priority. Family, is blood. We should never write off a family member. I implore people here. Do not have any regrets. Do what you have to do, to make amends with your family members. And even friends if thats the case. But I am more focused here on family. Because family is blood. Blood unites us in Christ. It is symbolic, to the structure. God is father, then there is mother, and then there is brothers and sisters etc. We cannot let the devil interfere with the family. Sometimes, we have to accept each other. Just the way that person is. Agree to disagree. But don’t let the devil steal your families love. That God intended to grow. Let go of that pride, that ugly characteristic of the devil! BEWARE! 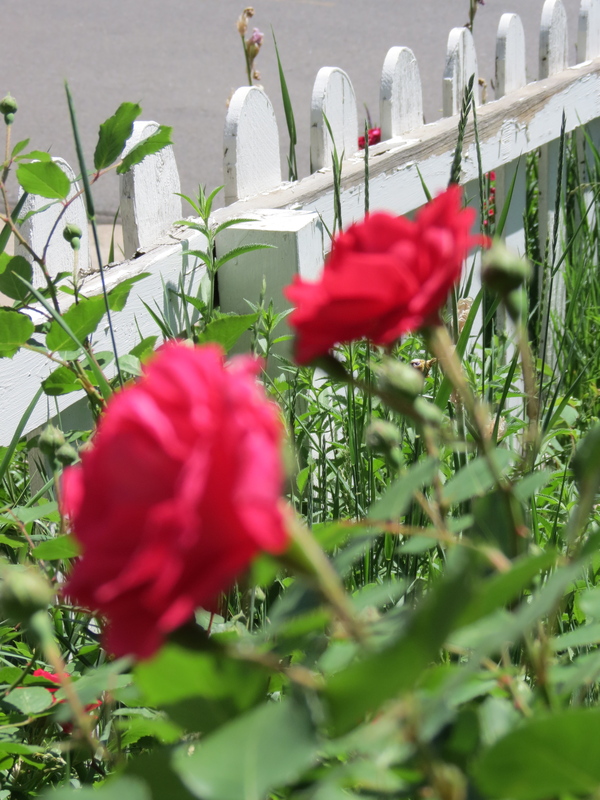 Send flowers now, while that person is alive, and send them a rose bush, send life….send them a plant…..with love, so they can see the love growing. 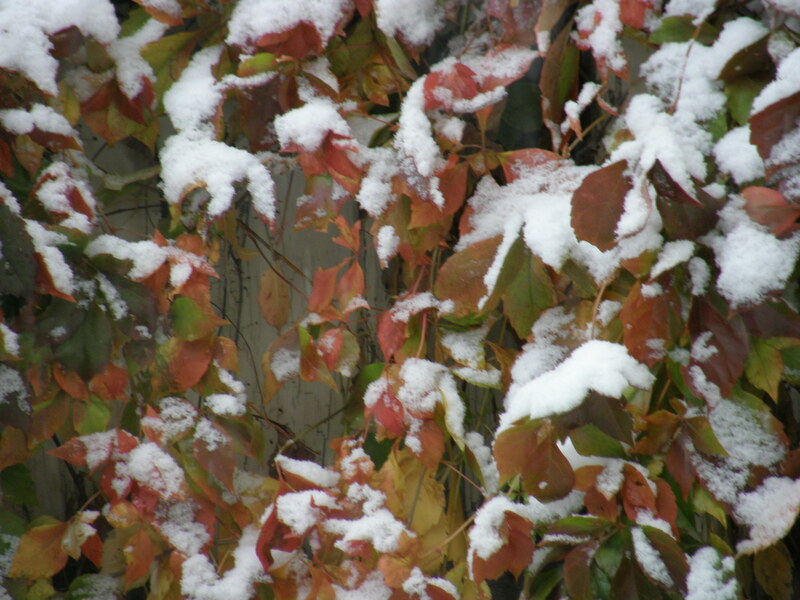 So they can know your love has not stopped growing…. Leave there thy gift before the altar, and go thy way, first be reconciled to thy brother and then come and offer thy gift. Matthew 5:24. And more then anything, so God can see the love. You don’t want regrets, when you, yourself, has to stand before God. Send the love now….send life. Send Christ with that plant, for He has come to give us all life, and life abundantly now! For it really does not matter who was right or wrong. It does not matter, what the problem was. You have to be mature in Christ. In the sense, that if you let God take care of it, by giving Love, to that person, He will take care of it. That which the devil intended for evil. God will turn it around and make it good, and right! Acts 16:30 AND THEY SAID, BELIEVE ON THE LORD JESUS CHRIST, AND THOU SHALT BE SAVED, AND THY HOUSE. You know, people, make mistakes. Even Christians make mistakes. No one is perfect, no one is exempt. The Bible tells us, we ALL have sinned, and come short of the glory of God. You could call some mistakes, though, disobedience, and sin. God knows the heart. I have made mistakes, and even spiritual mistakes. For I was one of those, who used to celebrate Halloween. Even as a Christian. And that just grieves me, if not for the blood of Jesus, I claim. That cleanses me of unrighteousness. But, if I did not tell you, I did do that, I would be a hypocrite. For, as I have grown, in my walk with God, I realize, the evilness of this Holiday. I realize God hates it. I realize, that it is a matter of honoring God, once you get it through your head, heart, and spirit. So, I am speaking against, this evil Holiday. You have to start somewhere, even if your track record, was wrong. You have to get on the straight and narrow path, with Christ. Not through the wide gate, where the whole world will go. And fall into the traps of hell. You have to see….with spiritual eyes. Truth. One may have good intentions. But if we give place to the devil by disobeying God, we will reap what we sow. What goes around, will come around. Some call it Karma. That for the record, is not a Biblical term. But in just trying to make this effective, in relating, we know, that this is a principle. It is understood. Like what goes up, must come down. Sin does return. And when you become a Christian, things in some cases might not necessarily, automatically, change. If you do not change your behavior, from wrong to right. And you do not renew your mind, with the word of God, to know, the truth, then your behavior, will stay the same. It is like a person, who has broken the laws of the land. Laws are meant to protect people, and the community. But say, someone, robbed a bank, and they got caught doing it. They knew, it was a crime, or even it was a sin, to steal, like the commandment says, but they broke the law. And they did the crime. Which, I pray, no one would do things like that. Our prisons, are filled, with people, who were never taught right from wrong. Maybe because they were never taught truth, from God. They broke the law. There was a loss, so society has implemented “laws” to protect the people, the society. Same for Gods Kingdom. Well, in understanding this, we need to know, that God, has created, laws, statutes, (not statues-idols) But God created, commandments, and principles, that define who He is, and who we can be in Him, as well. It means, He has a certain way of doing things, from His “Kingdom” perspective. Grace from God is such a wonderful, and good thing, in the life we live. Grace, even in some situations, makes a person, think they get away with things. But they don’t. Sin, is accounted to a person. It is written, in Gods books. Thats why repentance, seeking God, to be delivered from temptation, and to bring everything to the obedience of Christ, is so important. We must think always, in the forefront, and not take for granted, of what Christ did for us. That allows us grace. But someday, the grace will stop. Either when we die, or when the world ends. Or more specifically, when Christ returns. That grace, will no longer be accessible. It will be too late. But lets just say, for the sake of just making a point, what would Christ tell you, if He did return on Halloween? What would you tell Him, if He saw you in a silly costume? Or He saw you, celebrating? At a party where even the devil himself could be? Because He wears a mask. He hides, in deception. He could be, where you were celebrating. You know, Christ, sees you anyway. But what if Christ did return on Halloween, and the blinders came off of everyones eyes. What would ALL think or say, in their shame? That is why, it is so important, NOW, to make amends with God, to honor God. This even in this holiday, is a time, to open ones eyes, to their heart, soul, and being. Because God is not mocked. Because, we see in this world, the turmoil, we see, the uncertainty of so much, from our financial systems failing, to people, caught up in this, and that and the other, and we have to know truth. Gods truth. When any of us comes to Christ, we must want to be in a position of honoring him. We must be mindful of His love, that spares us. We must know, in our heart, of hearts, His power, His majesty. His system, His Kingdom, is not based on a democratic, sense of thinking. We are talking about God, and His ways, for they are not our ways. So we must know, we must determine in our hearts, to want to obey Him. To understand Him. To avoid, offending Him. The fear of God, is the beginning of wisdom. Dear one, if I could express this, in a way, you could understand, remember this. You may not think you are hurting anyone. You may not think, you are giving place to the devil. But, if you are doing anything, anything at all, that goes against Gods word, against His truth, or against His Kingdom, you will reap the results, from this. FOR YOU ARE HURTING YOURSELF….SPIRITUALLY. Honoring God, by knowing His word, knowing Him, in prayer, will prevent results, that God only knows, can spare you even from Hell. Dear one, Honoring God, is the greatest compliment, you can give to the one, who gives you life. But honoring God is truly a reflection of love, that you have for the one, who gave His life, for you, so you can be spared. Please for the sake of your salvation, consider this, do not take your salvation for granted. Do not take for granted, the Love, that which God gives in His love. In this matter of honoring God. you will consider this greatly. If you love God, you will love that which He loves, and hate that which He hates. Its not other people, its not you, its sin. So God hates the sin, that separates you. From Him. That means, God hates the devil. Halloween, is just one of those things God hates. Because it is so deceptive. So many people do not know the true origin of it. And I could write about all of its origin and that it is pagan, etc. All I will say, is that Holiday, comes from Hell itself. It is deceptive, and crafty like the devil. Never forget what the devil, did in the beginning to deceive Adam and Eve. And his plan, is to always deceive. But know this, you may not know all of Gods ways, but God can see so much clearer for you, if you just honor Him, and obey him. He can protect you. But what are you giving place to? God tells us, in His word. Woe to them, who call evil good, and good evil. He tells us, that we are not to have fellowship with darkness, if we are light, for there is no benefit. He tells us, to submit to Him, resist, the devil, and the devil will flee from us. Submitting to God, honors God. I do not understand, why churches, would even want to open their doors on that night, unless they had worship and praise to God. But to allow children, Christian children a way, to dress up, and give them candy, is really condoning the evil holiday. Its like putting a band aid on a wound. Lord have mercy. Remember it stems from hell. By allowing them this. They are unknowingly being disobedient to God. Or do they know? We cannot be “ify” in our walks with Christ. We better know, what pleases Him, what Honors Him, and we better change our minds, and hearts, to reflect love, that shows who we are in Christ. It is a matter of Honoring God. In everything we do. And as I close, I am reminded, of the scripture. Honor your Father, and mother, so it will go well with you. Deuteronomy 5:16. Do you really want to celebrate Halloween, knowing God hates it? Read His word, to find out. Search, and you will find the answers. I also have to add, I am not anybodies judge. I write this, to inspire your own thoughts, to bring perspective. This is the word of God, and the truth of God, will prevail. And I know….This is a strong message, but like I told a friend, you cannot sugar coat some things. This is spiritual warfare, one can be dealing with, and if I can help someone, see the truth, and their life changes, then I have done my job. Just my thoughts, with Love, and Honor to my Lord God. Thank you Jesus. This prayer is a prayer for someone who wants to give their heart to God, and to be assured, that when they die, they will find a place in the Kingdom of Heaven. This is a prayer of Salvation, to those who believe. to the Lord, and see him change your life. Christ died for me on the cross, and shed his blood. I want to turn away from my sins. Save me. Jesus, come into my heart, and be my personal Lord. I promise to obey you and follow you all the days of my life. Help me, break these curses, that have held me back in my life. Break the chains off of me spiritually, and physically. Please take the desire of things, that offend you away from me. Send your help to me, by your Holy Spirit. I want to live a good life, help me to seek you in your word, and to grow stronger in your ways. Help me to study your word, to be approved unto you, my God, a person not ashamed, rightly dividing the word of truth and to confess you as my Lord, and Savior. Lord, give me Love, help me to Love others, and to forgive, so you will forgive me, and hear my prayers. I do not want anything to separate me from your Love. Help me find a church, where I can be in fellowship with other Christians who will help me grow. I pray now, and believe I will know you in a sweeter way. I see myself clothed in robes of righteousness, and standing at your throne, as you embrace me. I see you write my name in the Book of Life, and the angels are rejoicing over this sinner, who is made new through you. I thank you, and give you praise for receiving me as your child in your Kingdom. When I die, because of this prayer, I will go to your heavenly kingdom. I will remember this day, as a day of new beginnings in my walk with you. Thank you Lord, again, for dying on the cross, forgiving me of my sins, and giving me Salvation through Christ, and by embracing me with your Love…..I confess, Jesus Christ as my Lord and savior, forever, Christ will live in me. In Jesus name. Amen I believe…. will give honor to God. Prayer of God Ministries is designed to offer you private, personalized prayer. Please write to us, if you need prayer. God does love you…. Please check this link below, to my FB page, and “like” it, to receive my updates, thoughts, and inspiration….or subscribe here, top right of the blog, to receive my current updates, via e-mail. Your e-mail address is kept confidential….